MANHATTAN — A boozing band of bad Santas who wreaked havoc during a seasonal drinking session through New York City deserve stockings full of coal, angry residents said. The annual SantaCon fund-raising pub crawl brought dozens of soused St. Nicks and scantily clad elves and Mrs. Clauses, and left a trail of trouble through Hell's Kitchen, Midtown, the East Village, Williamsburg — and even city hospitals, where at least four blacked-out participants ended up, law enforcement sources said. Among them was a rowdy Santa Claus who was taken to New York Presbyterian after falling on his face and knocking out his two front teeth, according to the sources. The cursing Kris Kringle was so rowdy in the emergency room that he was handcuffed and frog-marched past a group of onlookers, including kids, sources said. "He was calling them a bunch of pu----s," a source said. At least three other women also had to be taken to Manhattan hospitals after blacking out, sources said. One was taken to St. Luke-Roosevelt Hospital after she didn't remember how she got in a cab heading to Penn Station. 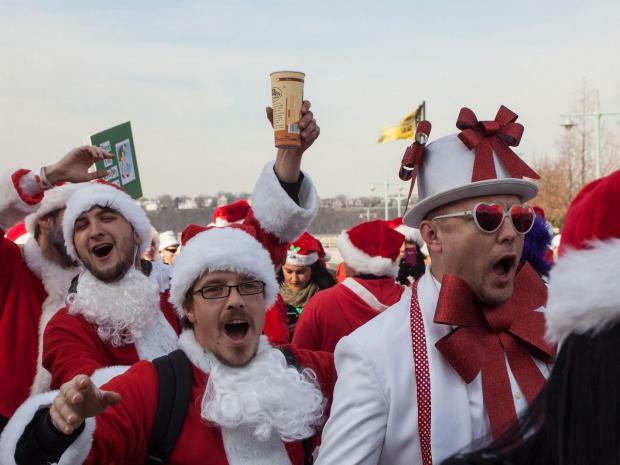 An NYPD spokesman was unable to confirm any SantaCon-related arrests. But the event has become an annual headache for local residents who see their sidewalks, streets and bars overrun by naughty behavior. Organizers chose Midtown and Hell's Kitchen as the location for this year's daytime festivities. Then the thousands of bar-hoppers headed to the East Village and Williamsburg for nighttime debauchery. Many Midtown and Hell's Kitchen residents — already frustrated by the over-saturation of nightlife in their neighborhoods — said the day-drinking Santas wreaked havoc outside their homes and in front of their kids. Katherine Consuelo-Johnson said she encountered many "drunken fools" on Saturday when she was out with her young children. "Santa is a role model for young children. You know, if you are naughty or nice kind of thing," she said. "Running around a family neighborhood with a 24-pack of Bud Light dressed as Santa seems to be how adults get their jollies nowadays. Talk about pathetic." Another mother in Midtown, who asked not to be named, said that a large group of male Santas near Penn Station gave her daughter the middle finger after she approached them, thinking they were the real deal. "She was full of Christmas joy and they ruined it," the mom said. "We deal with this enough at night as it is now." By noon crowds of Santas, elves and reindeer had filled many bars and blocked off the sidewalk outside the entrances. Early in the afternoon, a group of Santas swore at a passing family who tried to make their way through the crowds. Steve Belida, co-chairman of the Hell's Kitchen 50th-51st Street Block Association, also had a sour view of the Santas. "People turning St. Patrick's Day into a drunken festival is one thing," he said. "Now, Christmas is a time for drunks to ruin another holiday." SantaCon's organizers did not return requests for comment, but posted a note on its website in response to criticism titled "SantaCon: It's not just bros puking in your neighborhood!" "Santa Claus isn't just a menace to all that is good and holy: he also brings presents!" the message said. "On Saturday, sixty venues who participated in NYC SantaCon donated a portion of the day's proceeds to the Marine Toys for Tots Foundation: as of right now, they've reported $20,000, with a projected total of $45,000." Organizers said participants also donated roughly 6,850 pounds of canned food to City Harvest. But in the East Village, fed-up residents let out their rage on neighborhood blogs and some businesses, even bars, posted fliers warning Santas their commerce was not welcome, according to Susan Stetzer, district manager of Community Board 3. "As it is, it seems that our community has been given over to these pub crawlers who start drinking early in the morning," she wrote in an email to DNAinfo New York. "We have entire sidewalks covered and people forced into the street to walk, including old people with walkers." CB3 received complaints before and after the event from residents, Stetzer noted. She is advising concerned residents to notify their local police precincts, log complaints with 311 and write to elected leaders. "They [concerned residents] should express their feelings productively — not just to each other," she wrote. Not everyone was turned off by the holiday hijinks. Tom Dwyer, who owns the Midtown Irish pub Blarney Rock and collected food donations, said the event was a success for him and for the charities it supported. "A huge thanks to 99.9 percent of all the Santa Claus that hit Manhattan's SantaCon on Saturday," he said. "For the 0.1 percent who are assholes, please stay home next year."